"How else am I supposed to entertain myself around here?" You’ve always wanted a cute puppy, and now you live where you can have one. But when you bring your puppy home, his favorite pastime is destroying the place. Before you decide that having a puppy isn’t for you, learn about destructive puppy behavior and what to do about it. Puppies will be destructive around your house; they explore the world with their mouths. It’s common to come home to find your laundry strewn about the house and chewed. Even the contents of the garbage can be fodder for puppies. Destructive pups might also chew your door frames and window sills. But, punishing your puppy after he’s committed the crime won’t do any good. The only way to correct bad behavior is to catch him in the act. Meanwhile, puppy proof your home as much as possible by putting your laundry in hampers and shutting off garbage cans behind closed doors. Control destructive behavior by tiring out your pup before you leave the house. 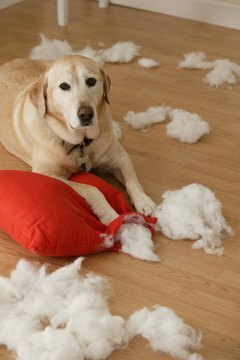 A tired dog is less likely to destroy things. An excellent way to tire your puppy is to invite another dog over to play with him. However, you need to supervise the dogs to make sure they’re playing properly. If they become too aggressive break them up to let them relax before sending them out for more play. If you don’t know any dogs who can be playmates for yours, a trip to the dog park can accomplish the same thing. If your puppy gets plenty of playtime and exercise from daily walks with you, then you can confine him to a crate or an area of the house he cannot destroy while you are gone. Jacque Schultz, director of animal services at the American Society for the Prevention of Cruelty to Animals, compares confining your pup to the way a mom confines her toddler to a crib or playpen when she needs to take a shower or get dinner started. Confining a puppy works the same way. The confinement area acts as a safe place for a destructive pooch. Confinement works best when used for short periods. Lonely pups tend to be destructive ones. If you will leave your puppy unsupervised and alone for most of the day, you are more likely to have a destructive puppy. Consider options such as day care or hiring a dog walker. If you will be gone for short periods only, leaving a puzzle toy that you can fill with treats provides your pup with a constructive activity instead of a destructive one. What if Your Puppy Won't Obey Commands?